Some of you might remember a post I wrote about half a year ago (when I was still attempting to fit a novel into a blog-post) about a very special event called Rainbow Corroboree, or Julinbah Yowarl in the native tongue of the Bunjalung people. 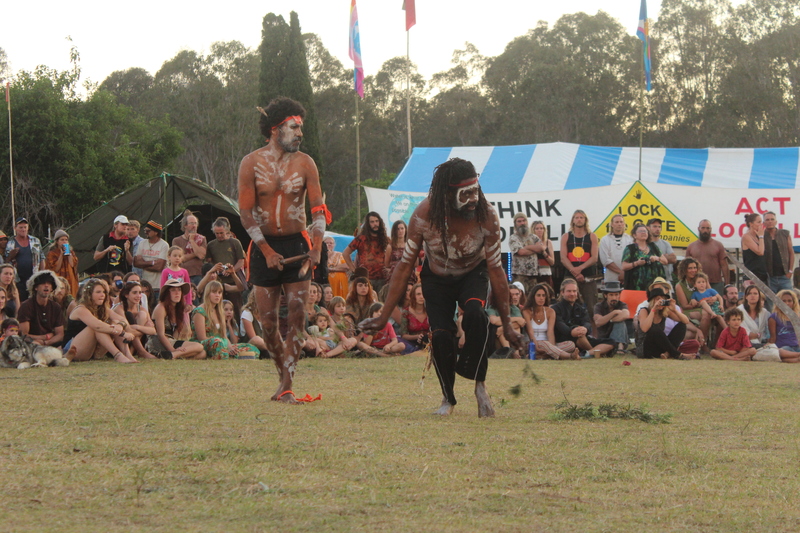 Every aboriginal ceremonial dance that I have seen so far, starts with a cleansing dance. Using branches with fresh leaves for “brooms” and lots of smoke, the cleansing dance is a way to clear away any bad spirits before the corroborree. The Julinbah Yowarl Rainbow Corroborree is held twice a year on every equinox . Instigated by the Bunjalung steward and holder of the local songlines, Lewis Walker, the event is a colorful celebration of Aboriginal culture and a way of building bridges between white and black Australia. It’s Australia Day and it’s raining. A lot. The party is not happening anywhere. 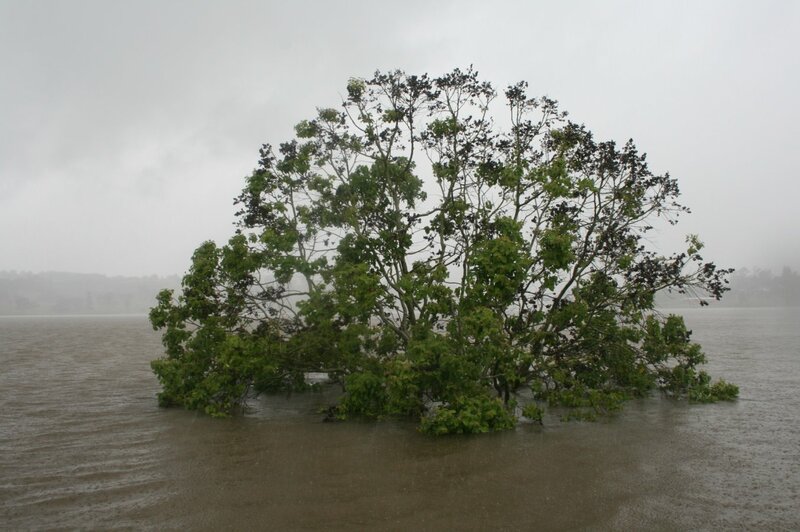 In fact, I am “flooded in”. The roads are under water and will be so for a few days. I have never seen rain like this in my life. More on that in a few days time. Meanwhile, I live on a hill and we have a boat, so we’re waiting it out. 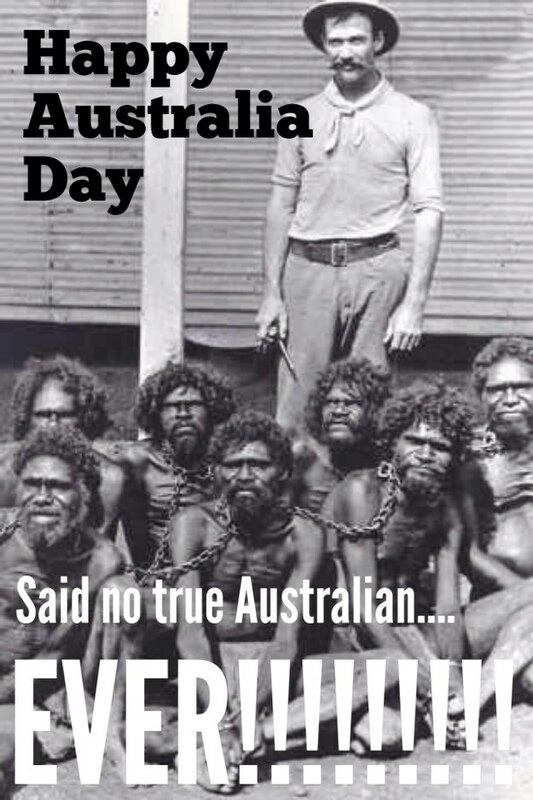 And speaking of boats, I’ve been reading up on why today is called Australia Day. The media is all over this historic day and the vultures are out to spin their coins and votes on the Aussie myth of multiculturalism. Yet it’s hard to ignore that today is the anniversary of the violent occupation of a whole continent inhabited by real people with an ancient history and wisdom. 225 years ago yesterday, a certain Captain Arthur Phillip and a few dozen soldiers, rowed ashore in Sydney Cove and took possession of Australia in the name of the English King George III. 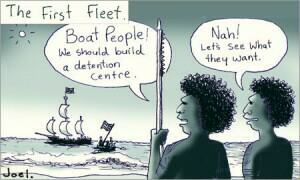 Australia’s very first boat people had arrived on the First Fleet and they started a prison as the first thing. I’ve just arrived in Cairns in the north-eastern part of Australia. It’s tropical here, and I am sitting on a veranda only a stone’s throw from the ocean. All around town there are backpackers hanging out in the parks and on the beach, eagerly awaiting the Total Solar Eclipse which can be seen from the area around Cairns early Wednesday morning. I feel incredibly lucky not having to wait in some anonymous guesthouse room or sleeping rough in the park, but instead staying in a beautiful old wooden house by the sea. The house belongs to my new friend Miriam whom I met at Ponyland when she was visiting her daughter. My first big travel out of Europe was to the South of Senegal in West Africa where I first had a human being tugging my sleeves, crying and begging me to help her kids in the name of Red Cross and all things good in the world. Heart-wrenching. Since then I’ve worked as a Human Rights Activist in Cambodia and as a journalist for the Tibetan cause in the Himalayas, and in my travels there has generally been a theme of going to hardship countries and fighting for the cause at hand. That evening I had my first taste of kangaroo meat (splendid taste!) before I’d even seen a live one. I am not sure how that fits into the Aboriginal practice of taking on the spirit of Guruman – as he is called among the Aboriginals of New South Wales – but for what it’s worth I had a wonderful spring night. To the Aboriginals, guruman is a powerful creature and a much revered and respected ancestor. But apparently a dead guruman isn’t above the need for food as they have been eating roos since they first threw spears. More interestingly, perhaps, they also used to stuff the scrotum (ball-sack) of the male guruman and play football with it! It was the famous explorer James Cook who, in 1770, first recorded the name “kangooroo” and legend has it that when he pointed to one of these large hopping creatures and asked an aboriginal man what it was called, the man replied “kangooroo” which apparently meant “I don’t have a clue what you are saying mate”. 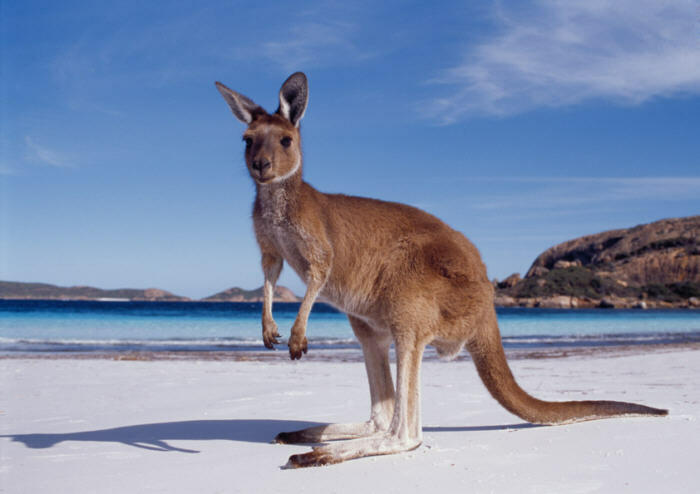 In any case, the name caught on and in the typical Asutralian fashion of abbreviating nearly every word, this magnificent animal is now commonly known as a “roo”. For the first two weeks I was looking everywhere for guruman with no luck. Not even on the long drive to remote Tabulam did I see one and I was getting really impatient. I guess I had thought they would be hopping around on the tarmac already as I got out of the airplane, knowing that guruman is an endemic species on the continent. Alas, there were only uptight customs officers to greet me, also an endemic species according to some of the travellers I have met here. It was Dave, the multi-talented and incredibly energetic guy who is a founding member of the Pony-Club. He had just returned from Sydney and late in the evening as he was approaching home, he’d found a dead roo on the road. Roadkill, as they call it. True to his conservationist ideals, he’d thrown it in the back of his car and as soon as the sun shone on the land he got up to rip the skin off of the unfortunate bugger and proceeded to separate the good meat from the bad. He’d been hopping out of joy over his find when he went to get me so I could wittness the butchering. 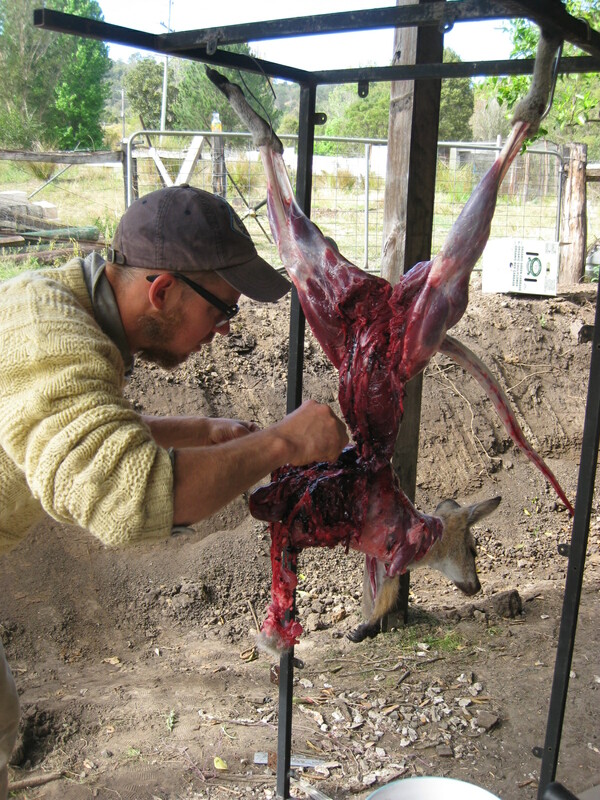 It seemed a bit early for me to have my first lesson in skinning a roo, but hey, how often do you get that kind of opportunity? I immediately got up and had a go at ripping the furry skin off with a sharp knife. Truth be told, it wasn’t even a real roo, but a specimen of guruman’s smaller cousin, the wallaby. Wallabys look very much like kangaroos, and for every practical aspect of the animal, the two are almost identical if not for the difference in size. 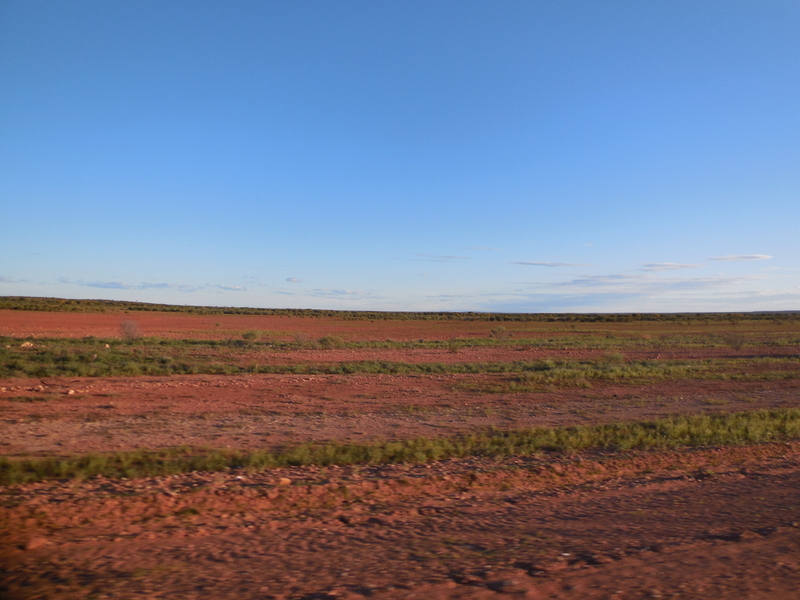 So the following morning, when I awoke to finally see what I thought was a real living guruman hopping about on the cow-field where I have pitched my modest tent, it was merely a local wallaby in pursuit of whatever food it could find. Beautiful as it was, and impressed as I was, it still wasn’t the real deal. I wanted to see a genuine (or as they say here; “fair dinkum”) guruman, and I still do. The wallaby I had seen was little more than a meter tall and it was rather scared of me as I rose from my bedding in the metallic-grey igloo, so out of place in the natural setting. A real guruman wouldn’t have batted an eyelid at my strange appearance; they grow to be 2 metres tall and weigh up to 90 kg. Throw in some pretty good boxing skills, a maximum speed of 70 km/h and the ability to swim, and you have one mean opponent staring you right in the face. Maybe it’s a good thing that I haven’t seen one up close yet..? In this day and age the guruman has become subject of a very curious study; how to eliminate the methane gasses released into the atmsophere by farting cows, thus posing a threat to our life-sustaining atmosphere. Thing is, roos don’t fart! Instead they have a bacteria in their intestines which breaks down the methane and converts it into more energy for jumping around. This is of great interests to a group of dedicated scientists, who wants to introduce guruman’s helpful bacterias into the stomachs of cows all over the world. Oh science… At this point my frantic imagination is feeding my mind with some great images of jumping cows and supermarket shelves stocked with kangaroo-milk. I’d better stop here before it all gets too strange. Thank you for showing interest in guruman, Australia’s finest national animal, found on everything from coins and emblems to the twisted bull-bars of roaring road-trains, plowing through mobs of roos in the desolate deserts of this weird and wonderful country. I hope that I get to see a real and living guruman some day, and I promise that I will take a picture of him and show it to you as soon as I do! I had been in the country for 8 days but had yet to experience anything beyond Byron Bay and I was itching to see the country side. My time had been spent figuring out how to join official Australia by registering with the tax office, setting up a bank account and genereally just figuring out how the System worked in this part of the world. But now the time had finally come to get my shirt dirty and go into the bush. My amazing new friend Rad (see Remarkable Encounters) had asked me if I wanted to join her in going to a so-called Rainbow Corroboree where Aboriginals from the region would be sharing some of their sacred dances with whoever felt like joining the event. Having always been fascinated with Aboriginal culture, and knowing how rare it was for white folks to be included in their ceremonies, I obviously jumped at the opportunity with great excitement, even without really knowing what I was getting into. When Rad pulled into the parking lot at the Arts Factory, it was the first time we had seen each other since we had initally met in India, some 5 months before. I was thrilled to be able to thank her in person with a great big hug for the support she had given me in Australia already. I was also thrilled to see her daughters again, the lovely Saisha and Pad, who are among the wisest and most grounded kids I have ever met. After a good long hugging session, we all climbed into Rad’s ancient and beautifully decorated campervan, cranked up some mellow reggae and got rolling into the hinterland of Northern New South Wales – on the way to a most unusual meeting of cultures. Climbing up and down the steep hills towards the heartland of Bunjalung culture, the tiny village of Tabulam, Rad told me more about the Rainbow Corroboree – also called “Julinbah Yowarl” by the indigenous Bunjalung Nation who refer to their land as the Rainbow Region. It turned out that this was more than just a display of Aboriginal culture to uninitiated spectators: This festival was going to be a gathering of people who were eager and willing to share their arts and their beliefs across the vast gap between Aboriginal and White Australia. Not only was I going to experience the Bunjalung’s sacred dances first hand, I was also going to meet hundreds of hippies, travellers and like-minded people. 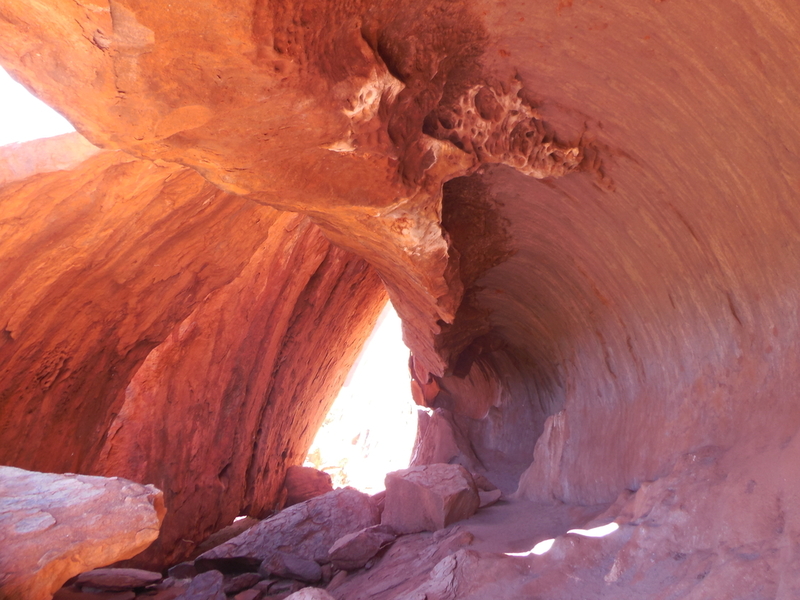 It seemed that I had struck a golden ore less than two weeks into my trip! The Julinbah Yowarl was started 4 years ago by a group of white Australians – who were more than just sympathetic towards the rights of Aboriginals – and a group of Bunjalung Elders and their much respected prodigy Uncle Lewis. To my understanding, Uncle Lewis has been chosen as the keeper and custodian of the local Bunjalung myths and legends, also known as songlines, and according to a Bunjalung Rainbow profecy the time has now come for the Bunjalung People to share their ancient wisdom with the rest of the world. As we drove through the gate to Uncle Lewis’ huge property outside of Tabulam, 5-year-old Padma took over the wheel, sitting on her mother’s lap, while we tried to figure out which of the handful of dirt tracks in front of us would lead to the festival-site. I’ve never seen a 5-year-old steer a car so competently (and stubbornly), and with everybody’s eyes on the road we found our way over a broad field and through the forest to a gorgeous meadow bordering a clear and sparkling river: We had finally arrived at the forefront of the ongoing reconciliation process between white and black Australians. Far from the bushy-faced, Santa-Claus-bodied image I had conjured, Uncle Lewis was as lean a warrior as I’ve ever seen, with a sharply defined and designed beard, long shiny black hair and rope-like muscles bulging under his deep brown skin as he hammered in the last peg of the Children’s Tent. “Jingiwala brother, heuw ya goin?” he addressed me as I rocked up to the site to offer my help. When he heard I’d come from the other side of the planet, he shook my hand and thanked me with a “booglebare” and his dark and intense eyes. He told me to start doing whatever I felt like doing. We’d arrived a day early and on the main site you could hardly tell there was going to be a festival happening only 24 hours later. But just a 3-minute walk down the riverside there were already a small temporary village of elaborate camper vans, home-made teepees, tents and improvised shelters. These were all full-time modern Australian hippie-gypsies it seemed, humans whose nomadic lifestyles and spiritual searches had brought them here several days early and most likely would only leave several days after the event was over. I quickly got head-hunted to rig up a sun-shelter for the Elders of the local Bunjalung tribe. It was the gentle and hard-working Sky who gave me the honourable task. Sky is a Polish force of nature who immigrated to Australia more than 30 years ago, protesting the Communist regime in his native land and dodging the compulsary military service that would have sent him fighting into Afghanistan. Some years ago, Sky and a few others had gotten to know some of the Bunjalung Elders of the area as well as Uncle Lewis. Together they had envisioned the Rainbow Corroboree which is now taking place twice a year at the time of equinox. Somehow I had managed to get to know the main organizers of the Rainbow Corroboree within a few hours of arriving at the event, and I was feeling grateful to the point where I hardly knew where to channel my emotions. After a long, hot and happy day, working away with the dedicated crew, I returned to the spot where Rad had put her van next to the river. On the way I enjoyed the setting sun behind the rolling hills and the eucalyptus and iron-bark forest, and the rising smoke from the many bonfires with laughing, cooking, singing and sleeping people sprawled around them – life was good! The next morning I decided to give the guys from the Rainbow Chai Tent a hand. As soon as they heard I was from Christiania they treated me like a long lost friend. One had been there and loved it, another one had heard about it and was curious to know more and a third one used be with the girl who painted the famous mural by the entrance of Christiania: “She must be an old woman by now” he laughed and tried to imagine if she would be as beautiful as he remembered her. There was no doubt, I was among family. As I made my way around the small festival area, lending a hand to whoever needed it, I rapidly made new friends from all over the world. With the scorching sun baking down on us from a clear blue sky, more and more camper vans and 4-wheel-drives came cravling over the hill and eventually the first band started playing from the main stage (the only one) and finally the festival was on. Whenever one felt drained from the heat, the refreshing river was only a short change of clothes away. It was so clean that many of us drank straight from it, enjoying the beneficial effects of the water which apparently contains a small amount of colloidal gold! 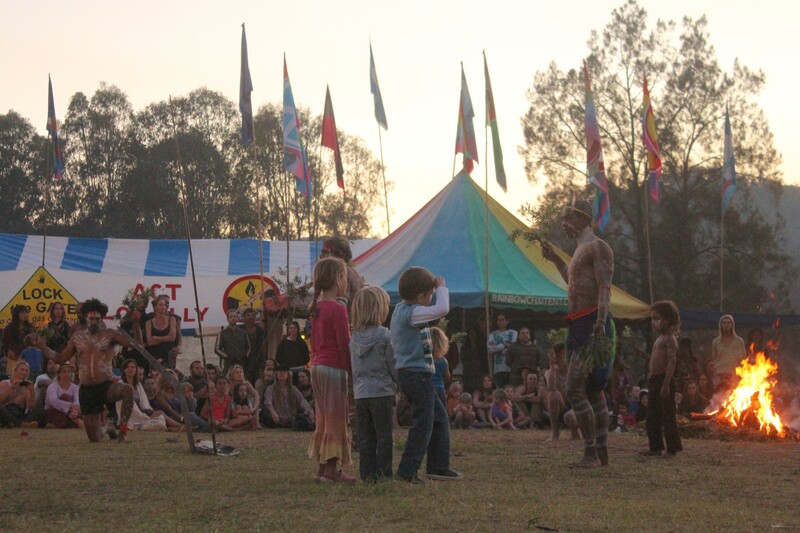 By sunset, most of us gathered around a great big bunfire where the festival’s daily highlight was about to commence for the first time: A corroboree is an indigenous Australian word for a performance which lies somewhere in between theatre and ceremony. I had heard that it was quite difficult to join a corroboree if you weren’t Aboriginal, so it was with immense anticipation that I watched my first corroboree unfold. These kids just spontaneously walked into the circle and created a small but powerful moment in Australia’s history. Once a big circle of people had formed and a hush had fell over the crowd, Uncle Lewis stood up in the middle and welcomed us all, clearly moved by the interest and diversity of everyone there. Then the dances began, all accompanied by a didjeridoo-player (I thought I’d heard good didj-players before…). Then came a series of dances dedicated to the various totem-animals of the Bunjalung People with the most prominent being the “Guruman” – or as we know it – the kangaroo. So life-like were the performances that the dancers seemed taken over by the spirit of the Guruman and its fellow creatures. There were also dances that re-enacted different everyday practices such as collecting mussles and picking berries, not to mention a heart-wrenching performance showing us the first encounter between Bunjalung People and European Settlers. 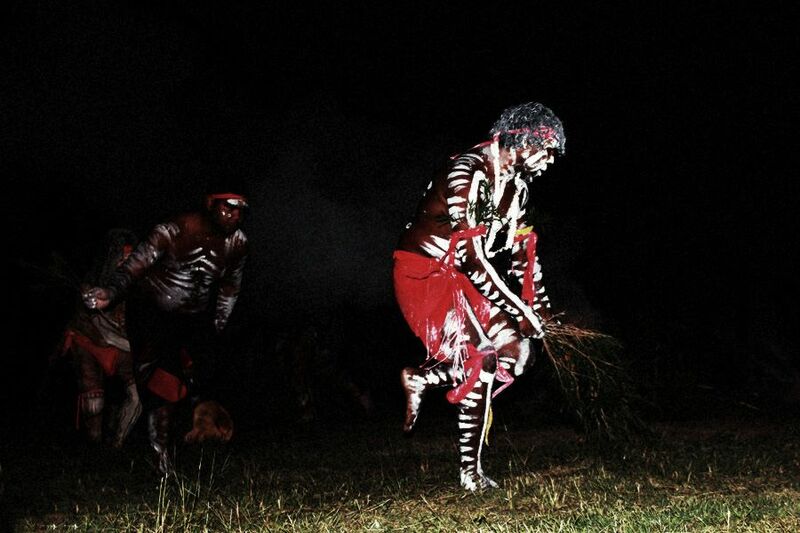 It is said that during a corroboree, the dancers interact with the “Dreamtime”. I can safely say that during the corroborees, which took place every evening of the festival, everyone present seemed transported into a living dream. During the very last dance of the very last corroboree, Uncle Lewis invited everyone to join in for a final cleansing dance. Needless to say, I jumped at the opportunity to become a part of Aboriginal culture, if only for a single dance. Afterwards I felt both elated and proud and it was definitely a highlight on my Australian journey so far! Throughout the festival – the biggest one held so far – I made friends with too many great humans to mention here, but I’m sure you will hear of many of them later on, as I made enough connections to keep me busy for a good while as I explore the area around Nimbin, a hub for Australia’s counter-culture and home to thousands of like-minded hippies, artists, gypsies and wisdom-seekers. I had so many golden moments that I am even struggling to remember them all as I write this. I cannot possibly thank my angel-friend Rad enough for inviting me to this incredibly beautiful festival – an event that started my journey through the spiritual realms of Australia and which I am sure will keep returning to me both in memory and through all the connections I made there. Thank you Uncle Lewis and your crew and thank you Australia!!! In this fairly complicated (and pretty twisted) world of capitalism, having a bank account is paramount for any money-handling citizen. Only in the last year have I realised what this means in practical life: In order to access public services, benefits and citizen’s rights, one is dependant on the willingness of a private company to handle your money! In my relatively short life I have already been a customer with 7 different banks and I have been using and abusing their services in the typical fashion of the mainstream consumer – mindlessly. Then I became aware of the oxymoron concept of “Ethical Banking” and I haven’t looked back since. If anything, it is the all-pervading and merciless energy of money that we as individual Human Beings have to grab the reins of and direct towards a sustainable model. Snoozing in my tent at the Rainbow Corroboree I’d overheard a conversation between a lovely-lazy psychic lady with a bent for loud laughs and Jim Beam and a steel-mandoline player with a hat full of dreadlocks and passionate attitude towards liberating Australia’s water supplies from Fluoride and other obnoxious chemicals. Personally, I never really liked paying to “the man” (however vague a figure he might be), so I decided to follow the advice. Plus I really liked the name “Southern Cross Credit Union”. I have always been fascinated with the star formation called the Southern Cross – a symbol and a metaphor for the new world in the Southern Hemisphere for so many Northern Hemisphere immigrants before me. To the native Australians, however, the star formation is known as a possum sitting in a tree, representing the sky deity Mirrabooka. Throw in the most visible dark nebula – “the Coalsack mark” – and this prominent patch of night sky becomes the head of “the Emu in the Sky”. Beautiful. Back in Byron Bay, I therefore went and chatted to the lovely ladies Julie and Lyn at the local branch of the Southern Cross Credit Union. To open a bank account here, all I had to do was to walk in with my Passport, Driver’s Licence, $10 and a letter from the Tax Office sent to my hostel, and 15 minutes later I walked out with an Australian bank account – simple as that! Simple, of course, because I belong to the privileged tribes of the so-called “developed countries” who have enough finacial leverage to allow its citizens access to the systems of other money-hoarding countries. If I was, say, a Congolese tribesman, it would have doubtlessly been a different story full of red tape and blatant racism. Ironically, the symbol of the most radical racists in Australia (violent and ignorant skinheads) is the very same Southern Cross, which, as it happens, also figures prominently on the Australian flag. 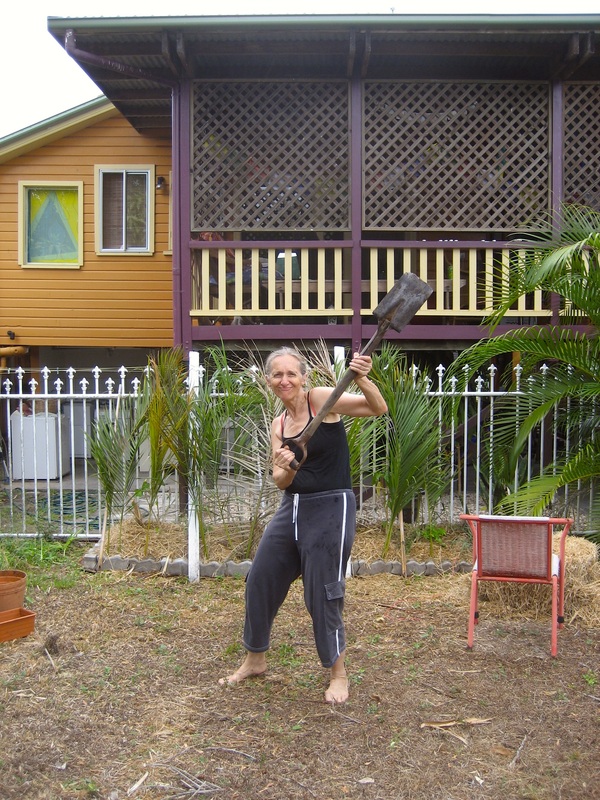 However, some tribes have access to Australia’s wealth-generating system across the enormous cultural – and historically tormented – gap between European colonialists and indigenous people, in Australia often referred to as Traditional Land Owners. We’re talking about the Aboriginals of course, who only recently have been treated with just a pinch of recognition. A director of an Aboriginal or Torres Strait Islander corporation within the meaning of the Aboriginal and Torres Strait Islander Commision Act 1989. From my understanding this means that all you need is a personal letter of recomendation from someone, anyone, who knows anyone in the world of Aboriginal bureacracy or business or simply from Gran’pa down the road in your local village. Pretty neat if you ask me.